With the warmer weather slowly making its arrival, it's the time of year that we think about heading to our local parks and playgrounds to spend the days at play! What kid doesn't like some playground fun, am I right? It can be a great way to get out of the house and generally doesn't cost any money at all--- a win/win! Check Hot Surfaces. In the bright sun, a lot of playground equipment can get very hot, very fast... so on those especially hot or sunshine-y days, be sure to check out the temps to make sure it's safe to play. Look for more shaded areas that tend to stay cooler! Unsafe Equipment. While most popular parks are pretty good at making sure the equipment is safe, it's never a bad idea to give it a quick once over, especially if it's an older park--- any nails sticking out, splintering wood, wobbling equipment, etc are best to steer away from. Also check the area for things like broken glass. Dress for Play. Comfortable clothes that are easy to move in (and okay to get dirty) are a must, but shoes are likely most important. My daughter's favorite shoes have a slight heel on them--- great for church, but not great for play. Instead go for comfortable shoes like tennis shoes, sneakers, etc. Sandals with a back strap can be okay, but keep in mind the specific playground too. Avoid flip flops as well as they can fly off much too easily! Wear Sunscreen. We might not think about it too much until summer, but sun safety is always important! If you're going to be outside, it's best to put on that sunscreen! Hats can be a great way to shield faces too! Stay Hydrated. We all know kids don't like to stop playing for... well anything... but staying well hydrated is crucial for safe playground time! Bring along a bottle of water, or Gatorade and make sure they're taking the necessary breaks--- especially on hot days! Know Their Limits. Kids love to explore and push the limits, and it can be great to allow them to do so to some degree... but sometimes we do have to lay some ground rules--- especially when we have little miniature daredevils who love to do all the things that they see the big kids doing! Unplug. Checking here and there is fine, of course! We all need that little break every now and again. But don't be so caught up in it that you lose track of what's going on around you! Be aware of other kids on the playground, adults who don't seem to be accompanying children, etc. Teach Proper Playground Manners. Manners are always important, but on the playground, it can be a matter of safety as well. Remind kids to check that slides are clear before going down, not to run in front of swings, no pushing through on stairs, etc. The park and playground is a great way to get outside, and with these simple ideas to keep in mind, you can do so more safely. Of course accidents can and do happen, but at least by practicing good playground safety we can avoid some of those! 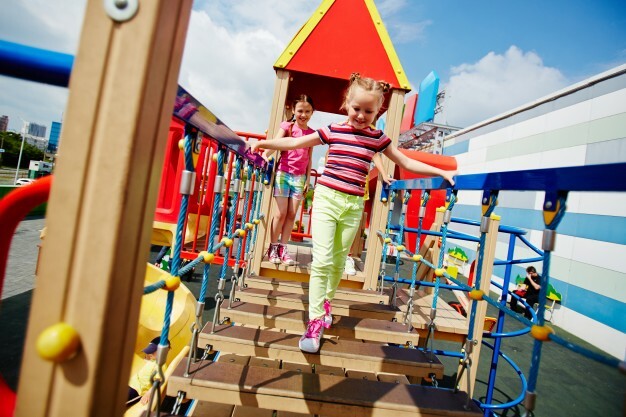 What playground safety tips do you have? How do you teach your kids to have fun, but be safe while at the park?